The Board and Management addressed feedback and questions from Unit Owners. Board President Michael Parrie, called the meeting to order at 7:47pm and confirmed a quorum of Board Members was present. Present from the Board was Board President Michael Parrie, 2nd Vice President Cheryl Ronnett, Treasurer Jean Shamo, and Secretary Kenneth Anderson. Member and 1st Vice President Monique Fouant was absent. Present from management was DK Condo Vice President and Director Ian Novak, Property Manager Timothy Patricio, and Assistant Manager Tricia Bulaclac. Social Committee Chair Sheldon Atovsky discussed the success of the recent Tower HangOuts Party. He said the Committee will be phasing out the people to people efforts going forward and that the next TGIF party will be postponed due to the availability of volunteers. Plans have come together for the annual Easter Egg Hunt and brunch, and the Committee is beginning to shift focus to plans for the annual 4th of July Party. Board ASCO Representative Cheryl Ronnett mentioned the next meeting is April 10, 2019, where there will be a discussion condo related legislative updates. On behalf of the Board, Board President Michael Parrie thanked the social committee and Vibe-Pass, our resident DJ Denis, for another successful Hang Outs, disco evening. He also thanked management for coordinating this year’s Green Week from April 22nd to 28th. All owners and residents should check out the list of activities as posted by management. He reminded owners and residents to be aware of garage power washing, scheduled for May 6th to 9th, and the bike room maintenance scheduled for May 13th to 17th. All cars and bikes need to be removed as announced by management in order to avoid a fee. After a motion by Michael Parrie, seconded by Monique Fouant, the Board of Directors voted unanimously in favor of a resolution to fine 6 unit owners $100 for the first month, to double thereafter for each subsequent month, up to the maximum fine of $1,000, for not providing adequate proof of insurance. After a motion by Michael Parrie, seconded by Jean Shamo, the Board of Directors voted unanimously in favor of a resolution to fine 1 unit owner $50 for the first month, to double thereafter for each subsequent month, up to the maximum fine of $200, for not attending the new residents’ meeting. After a motion by Ken Anderson, seconded by Cheryl Ronnett, the Board of Directors voted 4 to 1 in favor of a resolution to approve the minutes from the Board Meeting held on Monday March 11, 2019. Vice President Monique Fouant abstained, as she was not in attendance March 11th. Click Here to review or download approved minutes. 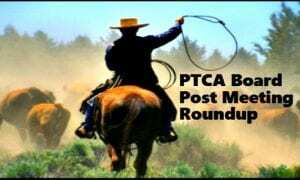 After a motion by Ken Anderson, seconded by Monique Fouant, the Board of Directors voted unanimously in favor of a resolution to approve scheduling of the 2019 PTCA Annual Meeting of Unit Owners for Monday June 10th, 2019, at 7:30pm, as well as Candidate meet and Greet events on Saturday June 1st at 11am and Wednesday June 5th at 7pm, and directs the necessary notices and mailings be drafted and distributed by Management as proposed. After a motion by Cheryl Ronnett, seconded by Jean Shamo, and discussion, the Board of Directors voted unanimously in favor of a resolution to approve the removal of bikes not removed by residents in time for the planned maintenance of the Bike Room the week of May 13th, at a cost of $50 to the corresponding Unit, as well as a $25 storage fee, and further it is understood the Park Tower Condo Association, its Board of Directors, Management, and staff will not be responsible for the destruction of locks to conduct such removals or the condition or damages to any bike following the effort. After a motion by Jean Shamo, seconded by Cheryl Ronnett, and discussion, the Board of Directors voted unanimously in favor of a resolution to approve a policy of requiring a government issued picture ID from those authorized to park on the main dock and issued a ‘dashboard pass’, which is anyone not in the process of a scheduled move, delivery or active loading and unloading, and that upon return of the dashboard pass, the staff will return the ID to the parker. After a motion by Monique Fouant, seconded by Cheryl Ronnett, and discussion, it was agreed to table the matter for further consideration and research by Management. After a motion by Monique Fouant, seconded by Kenneth Anderson, and discussion, the Board of Directors voted unanimously in favor of a resolution to approve from the March 11th 2019 for a proposal by TFA signs to install the new plaza sign, and instead approves the proposal by Triangle Signs And Awnings, for installation of the new sign and LED panel at a cost not to exceed $54,955, subject to securing the appropriate City of Chicago permit required for said signage. After a motion by Kenneth Anderson, seconded by Cheryl Ronnett, and discussion, and then an amended motion, the Board of Directors voted unanimously in favor of a resolution to approve the electrical repairs and panel replacement in the pool area at a cost not to exceed $15,725. After a motion by Cheryl Ronnett, seconded by Kenneth Anderson, the Board of Directors voted unanimously in favor of a resolution to approve replacement of the duplex boiler feed pump control panel by Fluid Technologies Pumps and Controls, Inc., as proposed at an expense of $35,300 to be funded by the Reserve Fund. After a motion by Kenneth Anderson, seconded by Monique Fouant, the Board of Directors voted unanimously in favor of a resolution to approve the proposal by DEMCO Mechanical, to replace the pool area air handler damper system as proposed at an expense of $13,401 to be funded by the Reserve Fund. After a motion by Cheryl Ronnett, seconded by Jean Shamo, the Board of Directors voted unanimously in favor of a resolution to approve masonry repairs to address leaking along the exterior wall of the bike room, as proposed by JLJ Contracting at a cost of $48,900, and an additional provision of $12,500 to address any unknown conditions as they arise, for a total of $61,400 to be funded by the Reserve Fund. After a motion by Michael Parrie, seconded by Jean Shamo, the Board of Directors voted unanimously in favor of a resolution to approve the remodeling plans of unit 2904 as submitted by the unit owners, following the recommendations of the chief engineer as outlined in their written specifications and in accordance with the Rules and Regulations and remodeling guidelines of the Park Tower Condo Association. Board Treasurer Jean Shamo reviewed the Fund Balances End of February 2019; Operating Funds wer $418,065 (decrease of $190,883 from prior month), Reserve Funds were $2,263,698 (increase of $236,401 from prior month) for a Total of Cash and Investments of $2,681,763 (decrease of $96,409 from prior month). She also reviewed February 2019 Revenue and Expenses; Total Operating Revenue was $517,188, Total Operating Expenses were $454,847, Income From Garage was $19,184, the Contribution To Reserve was made $136,675, resulting in a Total Deficit for the month of $55,149. After a motion by Jean Shamo, seconded by Cheryl Ronnett, the Board of Directors voted unanimously in favor of a resolution to approve the renewal of a $52,606.71 Certificate of Deposit with a 2.75% interest rate for 18 months with Harris Bank, for the Operating Fund investments, scheduled to mature on September 23, 2020. Property Manager Tim Patricio reviewed items of interest from the Monthly Activity Report, and recent sales activity. There being no further business, after a motion by Monique Fouant, seconded by Jean Shamo, and discussion, the Board of Directors voted unanimously in favor of a resolution to approve adjourning the April 8, 2019 Board Meeting at 8:44PM.